Herewith, the former director of the Internal Revenue Service’s Exempt Organizations division, now enjoying fully paid administrative leave at taxpayer expense, provided the perfect template for responding to her erstwhile agency. 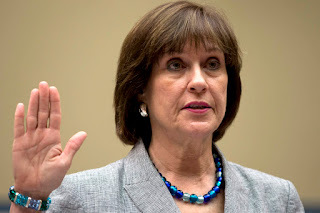 To wit, the next time the IRS contacts you with questions, just quote Lois Lerner. This was, of course, part of the abortive account Ms. Lerner gave to Rep. Darrell Issa’s committee as it investigated abusive and improper treatment of conservative groups by the IRS. But in saying little, Ms. Lerner spoke volumes. It is a funny thing, the urgency and insistence with which the IRS demands particulars of citizens. We are expected to respond promptly to them – yet they decline to answer to taxpayers. The richest bit of all, of course, is they work for us, despite their misapprehensions to the contrary. Ms. Lerner’s testimony – to the extent her self-serving opening statement, followed by a contemptible refusal to answer questions, can be classified as such – was only one part of the parade of horribles that has passed before Congress. Former IRS Commissioners Douglas Shulman and Steven Miller were utterly reptilian in their committee appearances and, for America, the spectacle should be instructive. Have a look at these people, all of them. See their smug, superior expressions, witness their imperious attitude, hear their unctuous words. These are individuals drunk on administrative authority no one voted them, intoxicated by petty power, and made to feel invincible by bureaucratic anonymity. In short, this is your tax department at work. And perfectly consistent with the new administrative state, those who fail or misbehave are rewarded. Beyond Ms. Lerner’s paid, indefinite vacation, Sarah Hall Ingram, who was commissioner for the IRS’ tax-exempt division while it targeted Tea Party groups, has received over $100,000 in bonuses and placed in charge of Obamacare enforcement. Put another way, the well-paid, unelected, formerly unknown bureaucrat who, despite working in the tax department, somehow became the arbiter of free speech, will now be in charge of scrutinizing your health care. Incidentally, if you think you can guess what such a person would look like, you’re right. This column has advocated abolishing the IRS and, thanks to this recent imbroglio, one no longer requires a tri-corner hat and Gadsen Flag to advance this policy position. This may be, as many have suggested, the most damaging of the scandals currently facing the Obama administration. But Obama will never face the voters again. What is much more significant is that politically uninvolved people, who heretofore had only a vague notion of the IRS as a necessary evil or a punch line, are coming to comprehend that the system is rotten and should be changed. A shift is occurring. People can see that a necessary evil might be just evil, or at least illegitimate, such that its demands do not carry their previous heft. If and when I hear from the IRS, will it be because I published this column? Or you, gentle reader, will you receive an unpleasant missive because you read or circulated it? We cannot know, and therein lay the insoluble problem of legitimacy. It’s not even a matter of being high-profile or important (you very well may be, though I most certainly am not). An automated system or assigned civil servant (to the extent there is a difference nowadays) could easily track and store information on inconvenient people, matching names for audits and inquiries. Considering the revelations of the past several weeks, does such a process seem far-fetched? So again, let us abolish the IRS. The institution was never liked, but plainly it cannot be trusted, either, and one is desolate to conceive of a scenario in which its legitimacy is regained. No matter how straightforward and sensible an idea, any idea, there are always cranks and contrarians who find some reason to be opposed (Chuck Schumer, please call your office). In this case, it would be interesting to hear from disinterested defenders of the status quo. Is there anyone out there who can seriously contend that the United States, ostensibly the greatest nation on Earth, cannot come up with a better system to fund its government? This is a legitimate question. Do you really believe the IRS is the best we can do, and will you defend its continued existence? You are cordially invited to respond. Meanwhile, if the IRS comes calling, just tell them what Lois Lerner said.